Intelligent, alert, friendly, and eager to please, the Toy American Eskimo loves to be in your company and doesn't do well without lots of love and attention. Lack of stimulation or human company will often cause him to lapse into bad behaviors, like barking, digging, or chewing. He has lots of energy and will need to be walked at least a few times per week. He is agile and athletic and loves to play games. He can be a bit yappy at times, but he's also an excellent watchdog and will bark to announce the presence of a stranger on his turf. He is one of the fastest learning breeds, so training him is easy. He is also great at learning tricks and has often been used as a circus dog. He's protective of his family and it usually takes him a little while to warm up to strangers. He gets along great with children. He is a very high shedder. You'll find a lot of hair on everything in your home; you'll be vacuuming the sofa and floor frequently! The "Eskie" is 9 to 12 inches tall (to shoulders) and weighs 6 to 10 pounds. He has a medium length, thick, double coat which consists of a dense undercoat and a harsher top coat. His coat comes in pure white and biscuit cream. The dead hairs in his coat naturally fall out. He also comes in two larger sizes, the Miniature American Eskimo Dog and the Standard American Eskimo Dog. The Toy, Standard, and Miniature American Eskimo Dogs are all identical except for their size, the Toy being the smallest. You only need to brush his coat occasionally, but because he sheds copious amounts of hair some owners find themselves brushing his coat daily to reduce hair in the home (what you brush out doesn't end up on your couch or carpet). The Toy American Eskimo Dog is a member of the Spitz family. 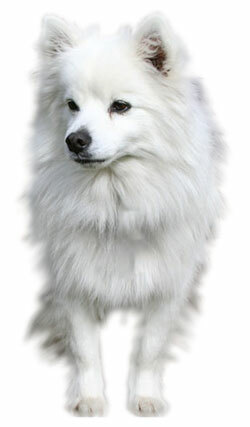 In America, in the 19th century, small, white Spitz-type dogs were found in communities of German immigrants. These dogs are where the Toy American Eskimo Dog comes from. It is believed that they descended from the European Spitzes including the white Keeshound, the white German Spitz, the white Pomeranian and the Volpino Italiano (also known as the white Italian Spitz). The Japanese Spitz may also have been used in his development. Late 19th century they were a very popular choice of dog for use in circus acts. This was because of their beautiful white coat, intelligence, trainability, and their agility. In 1985 the American Eskimo Dog club was formed. In 1995 the breed was recognized by the AKC and classified under the Non-Sporting Group. His AKC popularity in 2007 was 109th out of 157 breeds.